LabVIEW (Laboratory Virtual Instrumentation Engineering Workbench) developed by National Instruments is a graphical programming environment. Its ease of use allows engineers and students to streamline the creation of code visually, leaving time traditionally spent on debugging for true comprehension of DSP. This book is perfect for practicing engineers, as well as hardware and software technical managers who are familiar with DSP and are involved in system-level design. With this text, authors Kehtarnavaz and Kim have also provided a valuable resource for students in conventional engineering courses. The integrated lab exercises create an interactive experience which supports development of the hands-on skills essential for learning to navigate the LabVIEW program. 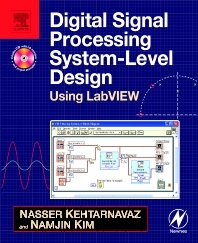 Digital Signal Processing System-Level Design Using LabVIEW is a comprehensive tool that will greatly accelerate the DSP learning process. Its thorough examination of LabVIEW leaves no question unanswered. LabVIEW is the program that will demystify DSP and this is the book that will show you how to master it. hardware and software technical managers and practicing engineers familiar with DSP and involved in system-level design using LabVIEW. These readers will be at companies involved with wireless communications, security systems, military systems, embedded control systems (automotive), e.g., Texas Instruments, Nokia, Ericsson, Motorola, GE, Sony, Raytheon, etc. Nasser Kehtarnavaz is Professor of Electrical Engineering at University of Texas at Dallas. He has written numerous papers and five other books pertaining to signal and image processing, and regularly teaches digital signal processing laboratory courses, for which this book is intended. Among his many professional activities, he is Coeditor-in-Chief of Journal of Real-Time Image Processing, and Chair of the Dallas Chapter of the IEEE Signal Processing Society. Dr. Kehtarnavaz is a Fellow of SPIE, a Senior Member of IEEE, and a Professional Engineer.